The Rebel Sweetheart. : What is Egg Donation, and Who Does This Kind of Treatment Benefit? What is Egg Donation, and Who Does This Kind of Treatment Benefit? When it comes to having a baby, things don't always go completely according to plan. If you have had trouble conceiving naturally, and have been diagnosed by your doctor with a condition that means that your own eggs are not suitable or accessible for standard IVF, you may worry that your hopes of having a normal pregnancy are over. However, thanks to women who donate their eggs to other women, you may still have a chance to have the pregnancy you long for. Clinics all over the world now offer IVF treatments that can use your partner's sperm or donated sperm (if you don't have a male partner or he himself also has fertility issues or a hereditary genetic condition you don't want passed on to the baby) along with donated eggs, where the embryos can be transferred into your own uterus for you to carry the baby to term and give birth to him or her naturally. What Is The Process For The Prospective Mother? If you are about to undergo a transfer of embryos from donor eggs to your womb, your uterus will first be prepared using hormone treatments. These will be administered at your assisted reproduction clinic of choice. During the period of your treatment, you will be required to be effectively 'on call', as when suitable eggs are donated you will need to be available to come to the clinic fast. The eggs, when found, will be fertilised in vitro or by microinjection, using either sperm collected from your partner on the day (this will require sexual abstinence on his part for a period beforehand), sperm gathered earlier in the process from him and cryogenically preserved, or sperm from a donor, depending on the course of action you have deemed most suitable for your case. Once fertilised eggs have been grown into viable embryos, your doctor will decide on the appropriate time to move them from the lab into your womb. They will also decide on how many and which embryos to use. The transfer process is relatively short and painless, as the embryos can be implanted without any more discomfort than a normal smear test. After that, it is simply a case of waiting to see if you have become pregnant! 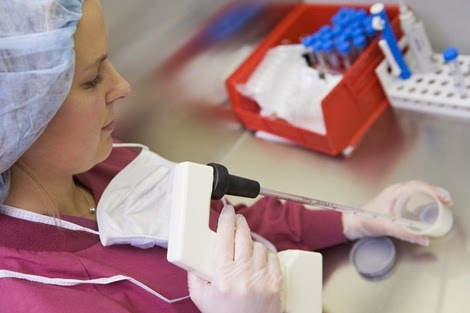 Viable embryos not used will usually be preserved so that if this round of treatment does not result in a successful pregnancy, more embryos can be transferred in a second round without all of the other stages needing to be done again. IVF using egg donation, such as that performed by the very popular IVI Spain clinics, has a very high success rate. IVI boast a 90% success rate in terms of their assisted reproduction processes leading to a full pregnancy. While no method of conception is ever guaranteed, for older women or women who have had various other problems that have left their eggs unsuitable for natural conception, it can be the best hope for a happy pregnancy.